James L. Jenney, coal and wood dealer, Middleborough, MA, billhead, 1890.
famine" of 1902-03, the same ton sold for exactly twice as much - $14. Reliance upon fossil fuels, fuel shortages and consequent high fuel prices are not confined to the present. In the past, such shortages could reach crisis levels with serious consequences. The most notable local fuel crisis prior to the 1970s oil embargo was the 1902-03 coal shortage when Middleborough and Lakeville confronted the threat of a severe winter without fuel. The 1902-03 shortage was prompted by a strike in the coalfields of eastern Pennsylvania. Labor action seemed endemic to the turn of the century coal industry, as mine workers sought better wages, shorter hours and improved working conditions. On May 12, 1902, the United Mine Workers of America (UMWA) struck in favor of these objectives and for recognition of their union. When coal mine owners proved unwilling to negotiate, the strike lengthened and the nation faced a looming disaster in the prospect of a severe shortage of coal which then provided the principal fuel source for heating, transportation and industry. “A coal famine in the winter is an ugly thing, and I fear we shall see terrible suffering and grave disaster”, President Theodore Roosevelt remarked to Senator Mark Hanna of Ohio, concerned that a protracted strike would have grave consequences beyond the mining industry. To avoid such a calamity, Roosevelt intervened directly in the labor dispute, becoming the first American president to take such action. In the face of continuing intransigence by mine owners, Roosevelt threatened a temporary federal takeover of the mines to prevent a coal shortage. Ultimately, federal intervention was successful, bringing about an end to the strike on October 23, 1902. Despite the ending of the strike, coal shortages would become widespread throughout the winter, created by nearly six months of suspended production in the Pennsylvania coalfields. Middleborough and Lakeville would be confronted with shortages throughout late 1902 and early 1903 which were exacerbated by the severe weather which was then among the coldest on record. Initially, prospects looked good for a sufficient supply, with the plentifulness of coal being reported in Middleborough in early December, 1902. Local coal dealers such as Bryant & Soule, J. L. Jenney and O’Hara Brothers continued to sell the article in ton and half-ton lots. Though the scarcity elsewhere had driven the price per ton up to $9.50 and $10, after Scott Barden began supplying coal he brought from East Taunton at $8.50, the other dealers cut their prices. Yet within ten days of this glowing report, virtually no coal was available for sale in Middleborough. While dealers did have the article on hand, the bulk had been pre-sold. There is little coal to be had in town now. O’Hara Bros. got some recently, but have only a ton and a quarter left. Every pound of the next three cars that arrive is sold. J. L. Jenney has about 15 tons, but that is all sold. Geo. F. Bryant received a car Saturday and another yesterday, and it is being carted to fill orders as fast as they can get it. 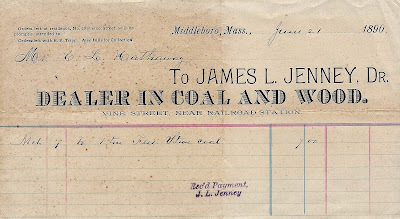 By the close of December, the situation was even direr, and Middleborough was characterized as being “in a worse condition than ever before.” The supply at O’Hara Brothers had been depleted, while J. L. Jenney had a supply of only 8 tons of hard (anthracite) and soft (bituminous) coal, and George F. Bryant a few tons of the less-preferred soft coal which had a lower heating value. One local correspondent despairingly remarked at the time that there wasn’t “much hope” for a renewed supply. It was inevitable, with suppliers being unable to sate the demand for coal, that its scarcity would bring with it higher prices. Such had been the case during the latter years of the Civil War when local coal sold for as much as $12 a ton. By mid-January, 1903, the price of coal per ton would rise as high as $14 at Middleborough, prompting to the Plymouth Old Colony Memorial to remark: “Middleboro people are still being held up in western style when they want coal.” But the high price proved no deterrent. 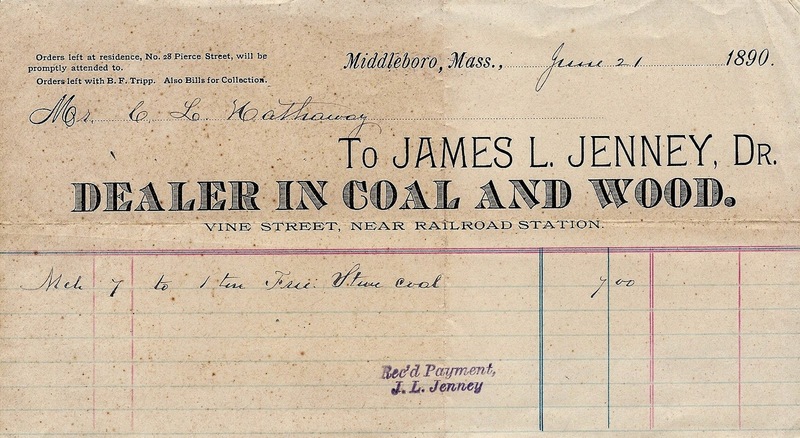 Four railroad carloads worth of coal sold from the J. L. Jenney coal yard on Vine Street on January 20 and was “gobbled up rapidly” despite its $14 per ton price. Not only coal, but wood soared in price. Pine lumber was reported scare in Middleborough in late 1902 with the price of standing timber being $1 higher than the previous year, “and would be buyers report that they do not find much for sale at that figure.” By 1903, dry wood of any kind was increasingly difficult to find, and green wood was resorted to for heating and sold for an unheard of price of $6 a cord. Nearby institutions such as the state farm in Bridgewater felt the scarcity sharply, and by January, 1903, inmates had been set to work chopping wood. In time, even wood and the men to harvest it would become scarce, and Lakeville was hard-pressed to find men to do the work. While most local householders were able to purchase some coal and wood throughout the winter to keep warm, even at inflated prices, the less fortunate within the community frequently faced the prospect of going without. Consequently, great demands were made upon Middleborough’s Overseers of the Poor who were responsible for the welfare of the community’s underprivileged. As early as late October, 1902, the Overseers had begun receiving numerous calls for wood and coal and they too would struggle throughout the winter to provide the article in sufficient quantities to warm the poor. The prospect of milder weather rapidly brought relief, both in terms of a lessening of demand, but also in a consequent drop in prices. “Coal is feeling the approach of spring,” reported the Memorial on Valentine’s Day, 1903. “Middleborough is receiving shipments quite freely, and the price there is $10.50 a ton. Similar lowering in cost has taken place all over this section.” By the close of February, local coal dealers were well supplied, and the price had declined further to $9 a ton. A month later, it had dropped still further to $8. The fuel famine of 1902-03 would remain one of the worst on record in Middleborough. An interesting postscript to the entire episode was the burglary which occurred after the worst was over. Perhaps expecting to find a large amount of cash from high priced coal sales over the previous months, burglars in mid-April, 1903, blew open the safe at the J. L. Jenney coal office on Vine Street. They were sorely disappointed, securing “25 cents in coppers, which was hardly up to the scale of wages demanded by the Burglars and Housebreakers’ Union”, according to the wry comment of a local correspondent. Old Colony Memorial, “News Notes”, October 25, 1902:3; ibid., November 1, 1902:1; ibid., November 22, 1902:3; ibid., December 27, 1902: 3; ibid., January 10, 1903:3; ibid., January 17, 1903:3; ibid., January 24, 1903:3; ibid., January 31, 1903:3; ibid., February 7, 1903:3; ibid., February 14, 1903:3; ibid., March 21, 1903:3; ibid., April 25, 1903:3. “Annual Report of the School Committee of the Town of Middleborough, Mass., for the Year 1902” in Annual Report of the Town Officers of Middleborough, Mass., for the Year 1902. Middleborough, MA: Town of Middleborough, 1903, pp. 8, 10. “Annual Report of the School Committee of the Town of Middleborough, Mass., for the Year 1903” in Annual Report of the Town Officers of Middleborough, Mass., for the Year 1903. Middleborough, MA: Town of Middleborough, 1904, p. 8. For further reading about the 1902 UMWA anthracite coal strike, see the Library of Congress and United States Department of Labor.